'I call our world Flatland, not because we call it so, but to make its nature clearer to you, my happy readers, who are privileged to live in Space. [Edwin Abbott.] 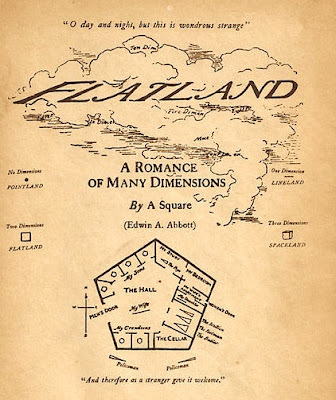 FLATLAND: A ROMANCE OF MANY DIMENSIONS. (With illustrations by the author, A Square.) Seeley & Co, London 1884. Our image shows the cover of the Blackwell's later edition but it is substantially the same as the 1884 first from Seely and Co., 'Flatland' is a science and mathematics fantasy that satirises class consciousness in Britain through the depiction of a society where geometrical characteristics are the basis for class distinctions and protocol: circles are the elite, with squares, triangles and lines subordinate in that order. Three dimensional objects are encountered only in the dreams of the populace, and anyone who claims the reality of a third dimension is considered mad. I can be seen as an attack on the staid and heartless Victorian society, with its bigotry and stultifying prejudice. "Irregulars" (cripples) are put to death, women have no rights at all, and when the protagonist in the story Mr. A. Square tries to teach his fellows about the third dimension, he is imprisoned. There is a good discussion of the work and 'Dimensionality' in general at the University of Winnipeg Cosmology site. '... Prior to Einstein's general theory of relativity, it aimed at redefining the frame of reference of our perceptions of the world, and opening up the possibility of the kind of self-awareness that came to characterize the modernist, and post-modernist, perspective...."
The precursor game is fun - I saw someone on TV recently claim that Saki was the forerunner of Monty Python and even The Mighty Boosh. John Betjeman once claimed Theodore Wratislaw was the first punk. Suvin in Victorian Science Fiction in the UK calls the book "A pioneer of SF as cognitive parable, and the culmination of UK SF up to that time." The 1884 first is cream-colored parchment over stiff wrappers. The US first a year later is a hardback. Much desired is the Arion Press 1980 edition in 275 copies, each signed by Ray Bradbury who provides the introduction, it comes with aluminum covers & aluminum case. There is a 1983 reprint with foreword by Isaac Asimov and in 2002 'The Annotated Flatland' appeared. The book is used in classrooms as a teaching aid and has been translated into many languages, it is especially liked in Spanish. There have been references to it in the Simpsons and people talk about it over at My Space, so it is still au courant. 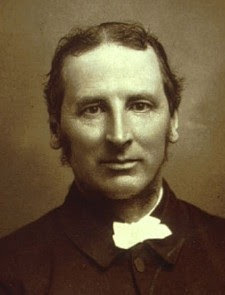 Edwin Abbott (1838 - 1926) was a London headmaster, a clergyman and author who wrote several theological works and a biography (1885) of Francis Bacon but is best known for his standard Shakespearian Grammar (1870) and of course this pseudonymous work. Dionys Burger has written 'Sphereland' (1965) a sequel to Flatland, that depicts the adventures of A Square's grandson, A Hexagon, who investigates the shape of flatland as it sits in three-space. Large octavo. 9 inches by 7. [2 blank], viii, -100, [2 blank] pp. Original publisher's off white printed and illustrated parchment over stiff card plain covers. Diagrams and figures in text by the author. Some small chips at spine and hinges and edges. Printed covers slight browned and slightly soiled - overall a sound about vg above average example of a vulnerable book. Contemporary neat inscription with some relevant quotes from Samuel Johnson on f.e.p dated 4 December 1884, initialled by one 'E.L.' As Lilly writes ". . . the most influential fantasy tale to explore mathematical theory. Satirically cast in autobiographical form, the narrator--- one A. Square---is an inhabitant of a two-dimensional universe who tries to conceive of what it would be like to live in three dimensions." OUTLOOK? A book that will always be good for a $1000 in decent condition. The trouble is that the kind of people who lusted after this book (geeks, boffins, technocrats) are no longer making silly money; however their time will come again so the book is one to hold on to through recession, slump and financial Armageddon. Also worth looking out for is the related 1907 fantasy novel by EA's fellow fourth dimensionalist C.H. Hinton - 'An Episode of Flatland; of How a Plane Folk Discovered the Third Dimension to Which is Added an Outline of the History of Unaea.' Currey has 3 copies in varying condition from $300 to $650. Stableford says of it -'....a very strange story (it) describes a two-dimensional world rather more complicated than Abbott's, and features a startling plot in which the inhabitants of a two- dimensional planet avoid collision with another by diverting their 'world' in[to] the third dimension, taking advantage of the fact that... their souls have access to more dimensions than their bodies." dude looks like Robin Williams grandad! The Hobbit. Or There and Back Again.